BroadConnect has been on the forefront of VoIP innovation for over two decades and is now a proven market leader in Cloud PBX, premise based IP and Unified Communications. Our carrier-grade application software, powered by Broadsoft or Microsoft, has been deployed in thousands of BroadConnect client offices. They depended on us to migrate them safely from traditional legacy infrastructures to mobile-ready cloud architectures offering the latest in advanced communications services. We provide you with access to the most advanced business communication services available today that will empower your workforce and reduce OPEX costs simultaneously. Is your phone system more than five years old? Are you spending money on support fees, configuration or hardware changes or software upgrades on your PBX? Do you have to pay to do any moves, additions or changes? Do you have technical interruptions when video conferencing on working remotely? Does your business suffer due to poor VoIP call quality, missed calls or an ineffectual support team? Have you been investigating how to get the best VoIP phone service for your business? Are you looking for a virtual phone service that uses VoIP technology to provide you with VoIP softphones? Office Connect gets you completely prepared for today’s business needs. Office Connect has all the traditional features of PBX telephony while providing the user with the most progressive IP voice system features for all your business requirements. Based on a per seat basis, there are NO hidden costs or concern for costly upgrades to the newest technology. Office Connect is the next generation of hosted pbx solutions that allows your business communications to be streamlined and efficient, while keeping your costs low. Increase the Efficiency and Flexibility of your Business Communications. SIP Trunking solves many of the problems facing organizations wanting to increase the efficiency of their communications by bringing voice communications onto the same digital platform and network as data. This levels the integration playing field. The big challenges are customizing and integrating SIP services into an existing phone system, as well as adopting unified communications. BroadConnect has been integrating SIP Trunking solutions of all types since 2005, providing business VoIP lines and VoIP numbers across Canada. The ideal way to improve your customer service offering. We offer call center solutions that are both flexible and affordable. Our solutions provide a feature-rich call center environment built on our coast-to-coast carrier-class platform. The rich feature set allows your companies to greatly improve customer care, create virtual call centers anywhere and manage calls effectively and efficiently through a centralized phone number or set of phone numbers. Redefining traditional business telephone systems. While traditional business phone systems were designed to serve workers at their office location, today’s worker often takes calls on route to a client, when working from home, or while away on a business trip – today’s workplace environment requires elements of unified communications. AVAYA IP-Office is simply IP-PBX Hardware that can act as the switchboard or PBX that allows call transfers and call routing, call holding, and conference calls among many other phone features over a digital or IP Network. AVAYA IP-Office can also be fully integrated with Unified Communications. Skype For Business is a full Unified Communications system that requires SIP Trunk integration for voice capabilities. 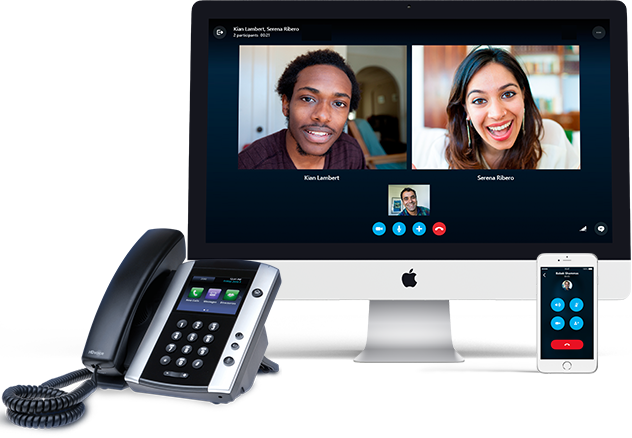 BroadConnect Canada is both a Certified Skype SIP Trunk provider and an AVAYA Platinum Partner – meaning we have the expertise required to deliver an array of VoIP Business Phone systems. Only the best business VoIP providers, like BroadConnect Canada, offer advanced phone system features that can take your business communications to the next level with Voice over IP services. Integrate your PBX delivery platform to a smartphone with MobileLink. Employees answer and make calls on their smartphones with their own business identity. Your employees can also access call logs and the corporate directory when on the go with UC-One. Smartphone calls on your office line offer significant cost reduction. Increase revenue, improve your business relationships, and provide enhanced access to your resources with Video Conferencing. Increase productivity, encourage collaboration, improve employee effectiveness, and reduce travel with the right solution for your organization. Send instant phone calls such as appointment reminders, payment collection, delivery confirmation, and more. All these functions are managed from our online Voice Broadcasting portal that is easy to use. Call Analytics are a vital business tool in today’s marketplace, providing you with real-time statistics on the marketing elements that drive customer responses. Identify marketing channels that deliver results with Call Analytics. Connect internally or externally with on-demand Audio Conferencing. We offer a feature-rich, robust service from a single platform with simplified controls. Our Audio Conferencing service meets the needs of companies from home-based businesses to large corporations. Interactive Voice Response features include directing callers or leading callers through a series of steps. BroadConnect’s expert assistance will enable you to design, develop, test, and implement an effective Interactive Voice Response [IVR] application as we create the best VoIP phone systems for our clients. Integrate your PBX delivery platform to a smartphone with UC-One. Employees can answer and make calls on their smartphones using their business phone identity. Team-One extends collaborative features on the device of your choice. In our fast paced work environment, these tools allow you to access all the services you need to get the job done. Not all Hosted PBX (VoIP) Providers are the same. BroadConnect has developed VoPI™, a private network which delivers its service over a highly secure network and has been optimized for quality. We have taken this step to ensure our customers will always have the highest level of voice quality possible. With our VoPI™ solution, we have become Canada`s leading Hosted PBX Provider, delivering the best VoIP solution for business telephone systems at a great price. BroadConnect has tremendous expertise in BroadSoft Core Communications Platforms, making us leading Voice over IP providers for Voice Services. BroadWorks: the popular VoIP [Voice over Internet Protocol] platform for expanded service reach, operational savings, and rich application integration. BroadCloud: BroadSoft’s fully managed service whereby administrators access a self-admin service portal and users access a service portal. UC-One: the unified voice, video, IM, communications, and web collaboration services for mobile and desktop platforms including Windows, Mac OS X, Android, and iOS. Productivity is dramatically boosted when all devices and tools are enabled to be integrated across all touch points. From your Blackberry or iPhone to Microsoft suites such as Office Communicator Mobile, Outlook or Office, your mobile workers will never be disconnected from your place of business. With Increased efficiency, improved communications, and heightened collaboration, a BroadConnect Unified Communications Solution will be right for you instead of selecting the cheapest VoIP service available.